On October 3rd, 2009 Courson Archaeological Research (CAR) staff and volunteers hosted its first annual Family Archaeology Field Day. The goal of this event was to increase the knowledge and appreciation of the prehistoric and historic cultures that occupied the region prior to settlement through “hands on” activities and games. This event, co-sponsored by the Museum of the Plains, Perryton, Texas, was geared toward families with children ages 6 and up. This family event was held at the Museum of the Plains from noon until 4:00 and began with a lunch (Figures 1-5). Shortly thereafter, participants were split up into individual groups and were escorted to one of seven different educational stations (Figure 6). Each station was led by one or two leaders and assisted by two or three additional volunteers. After thirty minutes of instruction and “hands on” activities, each group was escorted to the next station. The following provides a brief overview of the topics and activities associated with each of the seven stations. 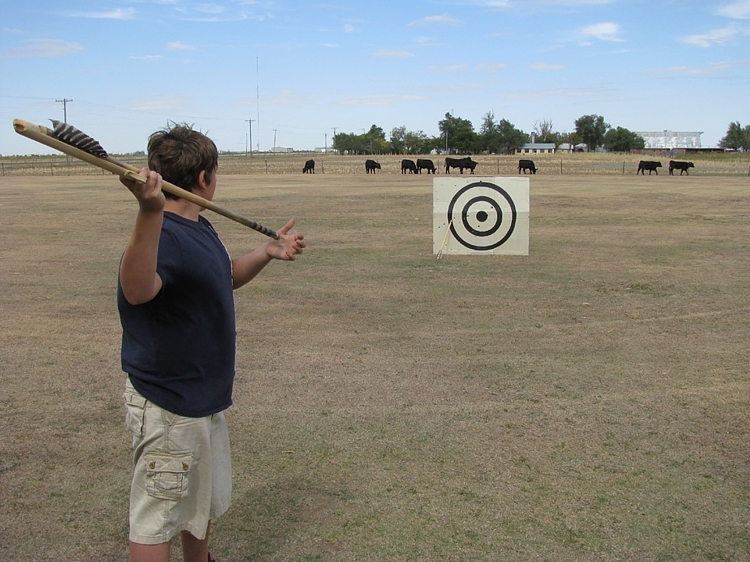 Two of the stations were held outdoors and provided an introduction to prehistoric hunting technologies of the Southern High Plains. At Station #1, participants learned about prehistoric hunting techniques in which spears propelled by a throwing stick known as an atlatl were used (Figure 7). The latter enabled spears to be thrown with much greater velocity and accuracy. This hunting technology was used by societies of the region from about 11,500 BC until sometime around A.D. 400 when the bow-and-arrow first appeared in the area. These spears were tipped with spear or dart points and were used to kill medium to large game, such as deer, pronghorn, and bison. After a short introduction on throwing techniques, participants honed their hunting techniques by throwing spears at a large target (Figures 8-17). At Station #2 participants learned about hunting smaller game. Short throwing sticks, called “Rabbit Sticks”, were likely used by adults and children to hunt small game, such as cottontails, jackrabbits, prairie dogs, and snakes. Once again, after a short introduction on throwing techniques, participants threw their sticks at one of three targets: a jackrabbit, an armadillo, and a jackalope (Figures 18-23). With one of the better shots of the day, Griffin Brosowske scored a “Kill Shot” on the highly sought after jackalope at a distance of 15.6 m (51 ft). The remaining stations were held inside the Museum of the Plains. At Station #3 participants were taught about flintknapping and the manufacture of chipped stone tools by prehistoric societies of the region (Figure 24). To eliminate the possibility of injury to participants while conducting a live flintknapping demonstration, a short, eight minute long video on flintknapping techniques was shown at this station (Figures 25 and 26). The video starred CAR volunteer James Coverdale and was filmed, produced, and edited by Shawn Barberee of PTSI (Panhandle Telecommunication Systems Incorporated). Following the video, a paper handout explaining the cultural chronology of the region and the various dart and arrowpoint types common to each of the prehistoric periods was distributed to participants (Figure 27). Also, on hand at this station was a comparative collection containing examples of stone raw materials commonly used in the area for the manufacture of chipped stone tools. Finally, using the guide handed out earlier participants were given a handout with illustrations of different projectile points of the area and were challenged to identify these artifacts. Station #4 introduced participants to one of the many games played by Native American societies of the Plains, including the Blackfoot, Assiniboine, Crow, Arikara, Mandan, Cheyenne, and Pawnee. This game, called the “Bear and Turtle Dice Game”, is played by two participants who sit opposite one another and hold eight, small wooden sticks. Each player takes a turn at tossing five, flat bone dice in a shallow basket. Two of the dice are marked with a figure representing the foot of a bear on one side and blank on the other. The other three dice are marked with a cross-shaped design representing the paint patterns often worn on the faces of Cheyenne girls on one side and blank on the other. Each of the rolls, consisting of a combination of bears, crosses, and blanks, has a certain numerical score ranging from zero to eight. If a player rolls a four, for example, then he or she wins that many sticks from their opponent. The game continues until one of the players wins all of the opposing players’ sticks (Figures 28-35). We made six sets of the “Bear and Turtle Dice Game” for our field day. These sets were modeled after a set collected from the Cheyenne in the 19th century contained in the collections of the Museum of the Fur Trade in Chadron, Nebraska. It was certainly fun to watch how excited the players got while playing this game! At Station #5 participants were introduced to Plains Indian ledger art. Ledger art represented a transitional art form that spanned the late pre-reservation and early reservation periods from about 1860 until 1890. Given the rapid reduction of the bison herds coupled with the increased availability of Euro-American goods acquired through trade and as annuity payments during this period, painting on bison hides was replaced by artwork on paper, cloth, canvas, and cowhide. This work is called “Ledger Art” since business ledger account books were most frequently used. In addition to new canvasses, Plains artists also made use of new implements, such as colored pencils, crayons, and at times, watercolors. Participants at this station learned that traditional Plains Indian artwork generally depicted hunting, raiding, and military exploits. Later, after the forced relocation from native tribal lands, artwork gradually came to reflect daily life on tribal reservations. Using colored pencils and card paper stock participants produced artwork in the traditional style of ledger art that depicted events in their lives (Figures 36-45). Field day participants were introduced to Plains Indian ornament and jewelry making at Station #6. Participants were shown actual examples of German silver ornaments and brass wire bracelets and finger rings recovered from historic period Kiowa camps and villages along Wolf Creek which are on display at the Museum of the Plains. Photographs taken by Will Soule of the Kiowa, Comanche, and Cheyenne from 1868 to 1874 were also shown to the participants to demonstrate how these items were worn by Native Americans of the region. After this brief introduction, participants were invited to make their own wire bracelet or glass bead necklace (Figures 46-60). Straight sections of copper wire in various lengths were prepared prior to the field day and were available for making bracelets. Also on hand were triangular and flat files for decorating bracelets with incised lines, cross-hatching or other designs. After decoration and polishing, the sections of copper wire were bent to fit using oval wooden forms made previously. Those electing to make necklaces were provided with reproduction pony and tile glass beads typical of those obtained through trade by the Southern Plains Tribes between the 1840’s and 1870’s. The beads provided included a wide variety of different colors and were strung on imitation sinew. If requested, younger participants were also provided with colored charts depicting different traditional bead patterns to use as models for their necklaces. All of the beads and sinew used for this station were purchased from the Crazy Crow Trading Post in Pottsburro, Texas. The final station of the field day examined the many uses of the yucca (Yucca glauca) plant by Native Americans of the region. For example, participants discovered that the root of this plant was pounded and mixed with water to make a shampoo, a lotion for minor skin irritations and rashes, and soap for general washing. The plant was also used for medicinal purposes. These included using a mixture of pulverized yucca root and tepid water for stomach aches and using the root in poultice wrap for inflammations and to stop bleeding. The leaves of the yucca plant can also be pounded to make them pliable and woven to produce baskets or matting. Prehistoric examples of yucca cordage, mats, and basketry have been recovered at several dry rockshelters along the margins of the Southern High Plains. Participants at this station were instructed on how to make cordage and rope using yucca leaves. The first step involves pounding the yucca leaves or spears on a stone anvil using a wooden mallet. The leaves are then scraped using the sharp edge of a chipped stone flake to remove the outer, fleshy material. At this point, the tough plant fibers remaining are twisted into small to large sized strands, depending on the diameter of the cordage desired, and braided together. After learning how to make cordage the participants were also shown how the end of a yucca leave can be pounded, scraped, and frayed to make a usable paintbrush. Using these implements the participants used watercolor paints to recreate pictographs or rock art painting typical of the prehistoric and historic periods of the Southern Plains (Figures 61-68). During the field day CAR employee Danny Witt manned an artifact identification table. Participants were invited to bring collections of artifacts and Danny helped with identification and aging. Also on display at the table were artifacts from the collections of CAR and a variety of free archaeological literature and posters (Figures 69-73). After a short break for lemonade and homemade cookies baked by some of our local Perryton volunteers (Figures 74 and 75), the 1st Annual Family Archaeology Field Day concluded with an awards ceremony. Here, all of the participants received a personalized certificate and a prize for their participation in the event (Figures 76-78). All in all, we were very excited with the overall success of this event. It was very well attended (Figures 79 and 80) and it was clear that the participants learned a lot about native peoples that inhabited our region prior to settlement. Perhaps most importantly, everyone who attended had a lot of fun! Courson Archaeological Research would like to thank all of the families that participated in this event, the Museum of the Plains for co-sponsoring the family field day, and all of the volunteers who helped prepare, organize, and put on the field day. We learned a lot from hosting this event and are looking forward to putting it on again next year!